Robinsons carries a wide variety of products, ranging from fashion apparel by international and local designers, to beauty brands and home decor. There are three Robinson outlets in Singapore. Visit the flagship Robinsons outlet at The Heeren on Orchard Road. Enjoy rebates and rewards when you sign up for the OCBC Robinsons Group VISA Card. Visit the webpage to browse through the latest in fashion and lifestyle products available at Robinsons. Robinsons carries an extensive range of exlusive and indie brands, including Mindbridge and SuperTrash. 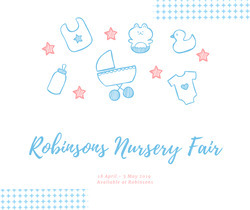 Robinsons was started more than 150 years ago. Do you want to receive more offers from Robinsons by email?